Universally acclaimed for its electrifying technical skill and shimmering, layered vocals, the Annie Moses Band brings its fresh sound and exhilarating showmanship to Diana Wortham Theatre Saturday, May 2, 2015 at 8:00 p.m. With recent debuts at Carnegie Hall and the Grand Ole Opry, as well as a hit PBS special to their credit, the Juilliard-trained members of the Annie Moses Band are wowing audiences across the nation with their distinctive blend of roots, classical, and jazz. Fiery strings, beautiful vocals, and a rocking rhythm section make this a perfect event for the music lover. The group’s latest project, American Rhapsody, is a panoramic exploration of America and American music. 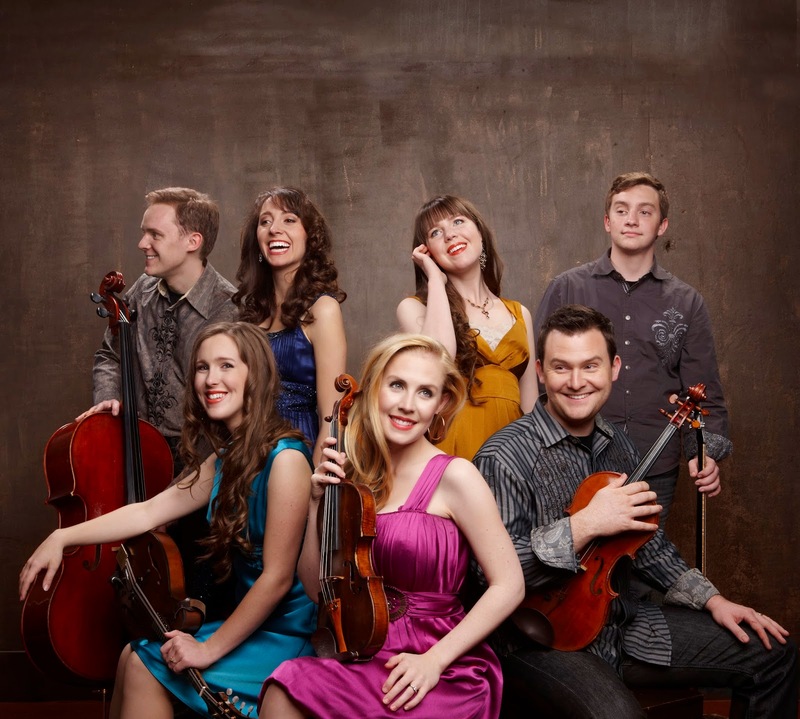 Featuring favorites from Aaron Copland, George Gershwin, and other legendary American composers, the program is a fusion of Appalachian bluegrass, Irish fiddle, favorite classical themes, and roots music, creating a quintessentially American musical experience. Most of the members of the Annie Moses Band are members of the same family as well, and are a musically diverse ensemble of instrumentalists and vocalists who are no strangers to musical innovations. Formed in 2002, the group is named for the family’s maternal great-grandmother, Annie Moses, who was a central figure in the family’s musical path. As children, each of the siblings took to different instruments and paths of training – then as adults came together to try out their well-honed chops on the stirring arrangements of veteran composer, Bill Wolaver. The colorful songwriting, weaving several musical styles together, reflects the group’s talent and diversity. The Annie Moses Band is: Annie Wolaver-Dupre on lead vocals and violin; Alex Wolaver on vocals and viola; Benjamin Wolaver on cello; Camille Wolaver on harp, keyboard and vocals; Gretchen Wolaver on violin, mandolin, and vocals; Jeremiah Wolaver on classical and electric guitars; Berklee Wolaver on vocals; Bill Wolaver on piano; James DaSilva on Bass, and Mark Nemer on drums. Opening for the Annie Moses Band is award-winning singer Joshua Carswell, an artful performer whose breathtaking vocal agility is at the heart of his signature sound. Singing pop originals, folk melodies, and stunning interpretations of beloved American classics, Carswell's repertoire reaches across the artistic spectrum to craft an impressive musical presentation. Annie Moses Band’s Asheville performance is made possible by Performance Sponsors Don and Nancy Ackermann Cole; and by Mainstage Music Series Sponsors Henry LaBrun, First Citizens Bank, The Omni Grove Park Inn, and Ward and Smith, P.A. ; with additional support from Media Sponsors WNC magazine, 880AM The Revolution, and News Radio 570 WWNC. The entrance for the Diana Wortham Theatre is marked by the location of the theatre’s marquee between 12 and 14 Biltmore Avenue. Patrons enter the theatre through the breezeway between Marble Slab Creamery and White Duck Taco, and into a large interior courtyard with multiple glass doors to the theatre’s main lobby and box office. The intimate theatre seats just over 500 and boasts exceptional acoustics and sightlines, making it the premier performance space in Western North Carolina. The Mainstage Series is supported by a grant from the North Carolina Arts Council, a state agency. The Mainstage Series 2014/2015 Season Sponsors are the Asheville Scene, Blue Moon Water, Creative Energy, Everyday Gourmet, Laurey’s Catering and Gourmet-to-go, the North Carolina Arts Council, and the Renaissance Asheville Hotel. To obtain more information on the Mainstage Series or to purchase tickets, call the theatre’s box office at (828) 257-4530 or visit www.dwtheatre.com.